The Israeli Navy (Hebrew: חיל הים הישראלי‎‎, Ḥeil HaYam HaYisraeli (English: Sea Corps of Israel); Arabic: البحرية الإسرائيلية‎‎) is the naval warfare service arm of the Israel Defense Forces, operating primarily in the Mediterranean Sea theater as well as the Gulf of Aqaba and the Red Sea theater. 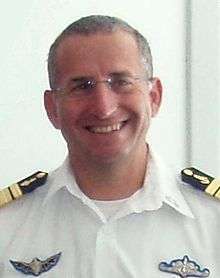 The current commander in chief of the Israeli Navy is Aluf Ram Rothberg. The Israeli Navy is believed to be responsible for maintaining Israel's offshore nuclear second strike capability. 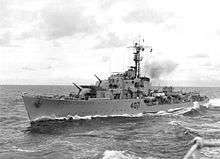 INS Eilat, ex-Royal Navy Z Class destroyer sold to Israel in 1955. In 1942, eleven hundred Haganah volunteers joined the Royal Navy, mostly in technical roles (12 of them were officers by the nomination agreement of the Jewish Agency with the Royal Navy). A few reached sea service and combat service. Two of them served with the Fleet Air Arm (FAA), one of whom was Edmond Wilhelm Brillant and the other Zvi Avidror. With the end of the Second World War, Palyam members took part in clandestine immigration activities, bringing Europe's Jews to Palestine, as well as commando actions against Royal Navy deportation ships. Royal Navy volunteers, meanwhile, rejoined the Haganah. During the last months of British Mandate in Palestine, the former Royal Navy volunteers started work on the captured clandestine immigration ships (known as the Fleet of Shadows) in Haifa harbor, salvaged a few and pressed them into service. These were to become the Navy's first ships and saw service in the 1948 Israeli War of Independence. 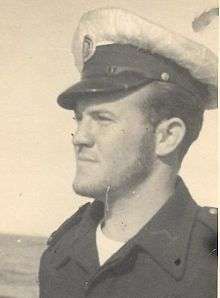 Aharon "Eskimo" Ben Yosef, commander of Shayetet 13, naval special forces. Royal Navy Volunteers with the technical skills and discipline acquired from the Royal Navy, though with no active sea service and experience on Royal Navy Ships. Palyam members who had led the clandestine and immigration effort, but had no sea background in navigation or leading a ship into a battle. The captains of clandestine and immigration ships were Italian, while Palyam personnel were commanding the ship under instructions from the Haganah. Ike Aharonowitch, captain of the Exodus and a Jew, was the exception rather than the rule. Merchant Marine captains and chief engineers, possessing navigation skills but lacking combat skills. Jewish volunteers from the U.S. Navy and Royal Navy, such as Commander Paul Shulman of the U.S. Navy, and Commanders Solomon and Allen Burk of the Royal Navy. These, however, were often discriminated against and their experience wasted by a navy command that was based on the Palmach and its various branches. This resulted in odd situations where unskilled officers from the Palyam were in command of far more experienced naval officers. During the war, the warships served on coastal patrol duties and bombarded Arab targets on land, including Egyptian coastal installations in and around the Gaza area all the way to Port Said. 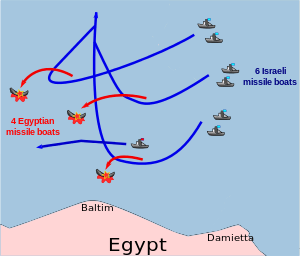 The Israeli Navy also engaged the Egyptian Navy at sea during Operation Yoav, and the Egyptian Navy's flagship, the Emir Farouk, was sunk in an operation by Israeli naval commandos. Torpedo boats of the Israeli Navy. Built by Chantiers Navals de Meulan, France. To make matters worse, Palyam personnel often resisted efforts to instil order, discipline and rank in the newly formed service. Mess rooms were initially shared by both officers and enlisted men. Ships possessed a captain with nautical skills, but also a commanding officer regarded as political. This would cause a great deal of debate between veterans of the Palyam, Royal Navy volunteers from the Haganah and U.S. Navy Machal volunteers about what form the Navy should take. Commander Allen Burk is reputed to have said, out of despair, "You cannot make naval officers from cowboys". RN Captain Ashe Lincoln , who was Jewish, advised PM Ben-Gurion to purchase corvettes, frigates, destroyers, torpedo-boats, and patrol boats to build up the Israeli Navy power. For that sake he urged Ben-Gurion to consult with professional navy advisers. This resulted in instructions to contact U.S. Navy advisors, mainly Commander Paul Shulman from the U.S. Navy. The Israeli Navy suffered from a lack of professional command during its early days. Gershon Zak, head of the IDF "Sea Service", was a teacher and bureaucrat without any relevant experience. Having never been recruited into the IDF, Zak was a civilian and had no official rank. The early days of the Israeli Navy were therefore characterized by political infighting, as many groups and individuals jockeyed for power. Palyam politics blocked the nomination of Paul Shulman (a Jewish U.S. Navy officer with a rank of Commander who volunteered for the Israeli Navy) as Navy-Commander in Chief and he resigned in 1949. The first Navy-Commander in Chief awarded the rank of Aluf was Shlomo Shamir. The conclusion of the 1948 war afforded the navy the time to build up its strength. Beginning in the early 1950s the navy purchased frigates, torpedo boats, destroyers, and eventually submarines. 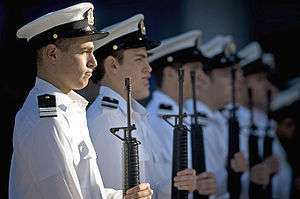 The material build-up was accompanied by the training of Israeli Navy officers in Royal Navy academies in the UK and Malta, as well as in France. The missile boats era, beginning in 1965 and bearing fruit during the 1973 Yom Kippur War. Until 1967 the Naval Headquarters were located at Stella-Marris, on the slopes of Mount Carmel, Haifa. After the Six-Day War it was relocated to the Kirya in Tel Aviv, next to IDF Headquarters. 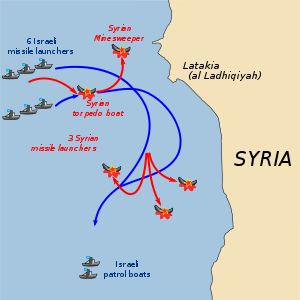 In the most significant engagement in its history, during the Yom Kippur War the Israeli Navy sank five Syrian ships without a loss during the Battle of Latakia. As a result, the Syrian Navy remained in port for the remainder of the conflict. Sleeve rank of Israeli Navy Commander-in-Chief is a rank of honor. This began as special permission from Lt. General Amnon Lipkin-Shahak (then chief of staff of the IDF) and allows the Navy Commander-in-Chief to have a sleeve rank of Vice Admiral which is equal to Lt. General, the rank of the IDF Chief of Staff. However the de facto rank of Israeli Navy Commander-in-Chief is Rear Admiral and the gesture given to the navy is ceremonial only when meeting foreign commanding officers. The same resolution as mentioned above applies to the rank of Commodore. There is ceremonial-only sleeve rank of Rear–Admiral while by the IDF hierarchy and chain of command he remains a commodore. Haifa – Missile Boats Flotilla, the Submarine Flotilla, Patrol Boats Squadron 914. The emblem of the Haifa naval base is two arrows – one signifying the Missile Boats Flotilla and the other the Submarine Flotilla. Atlit – home to Shayetet 13, the navy's elite commando unit. Ashdod – mainly a base for Patrol Boats Squadron 916. The emblem of the Ashdod naval base is two opposing arrows. Eilat – Patrol Boats Squadron 915. Eilat naval base was founded in 1951 and has been responsible for the Israeli Navy's Red Sea theater since 1981, when the Red Sea Naval Command Center was withdrawn from Sharm el-Sheikh in accordance with the Egyptian–Israeli peace treaty. The emblem of the Eilat naval base represents the red roofs of Eilat. 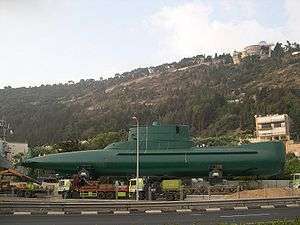 The Naval Training base – located in Haifa, contains the submarine operations school, the missile boat operations school and the naval command school. The naval training base also functions as the Israeli Naval Academy. The emblem of the Haifa training base is an owl, symbolizing wisdom and hard learning. Mamtam – IT, processing and computing. Mamtam is a small unit responsible for all Israeli Navy signal and IT systems, both logistic and operational. The soldiers that serve there are mainly programmers and university graduates in engineering, computer science and other technological professions. Navy Headquarters – HaKirya, Tel Aviv. Based in Haifa, Eilat, and Ashdod respectively, Squadrons 914, 915, and 916 defend Israels' shores from near by. Constant patrols in the seas of Israel. Identification of watercraft entering Israeli waters. Protecting national assets, such as drilling rigs. 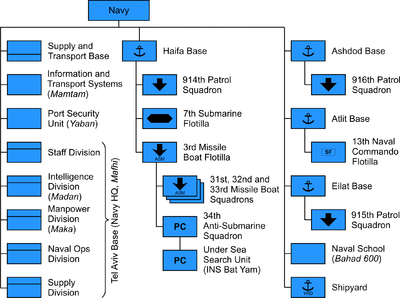 Various operations carried out alone, or with other units in and outside of the navy. Various other objectives that differ between the squadrons. The Missile Boats Flotilla, based at Haifa. Protecting Israeli commerce at sea from foreign fleets. Preventing a possible naval blockade of Israeli ports during wartime. Blockading enemy ports at wartime. The Submarine Flotilla, an elite volunteer unit founded in 1959. Attacking enemy craft in their home ports. Acting as a support unit for other units. Believed to be part of the country's nuclear weapons capability. For security reasons applicants with dual citizenship, must now officially renounce all other citizenships to be accepted into the submarine service training program. Shayetet 13, or Flotilla 13, is an elite naval commando unit which specializes in sea-to-land incursions, counter-terrorism, sabotage operations, maritime intelligence gathering, maritime hostage rescue, and boarding. It is among the most highly trained and secretive units in the Israeli military. Salvage and underwater works unit. Formed as the damage control branch of the Navy Shipyards, the unit later incorporated experienced Flotilla-13 divers. The Corps' relies on its Naval Intelligence Division for naval intelligence. 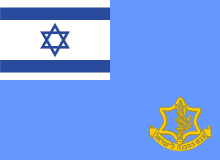 The Givati Brigade, an infantry brigade of the Israel Defense Forces, served as its amphibious force until the early 1990s. The 11th Flotilla (disbanded in 1993) would transport the troops on various transport vessels. "INS" stands for "Israeli Navy Ship". Aircraft operated by the Israeli Navy, even when including on-board Navy mission specialists, are flown and maintained by Israeli Air Force personnel and are part of the air force command structure. 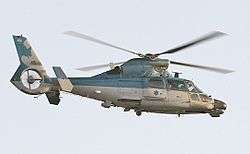 The navy has an unmanned helicopter (manufactured by Aeronautics Defense Systems) on Sa'ar 5-class corvettes. Popeye (AGM-142 Have Nap) – air/sub-launched cruise missile. Dolphin-class submarines believed to carry Popeye Turbo with a range >1500 km and the option for nuclear warheads. 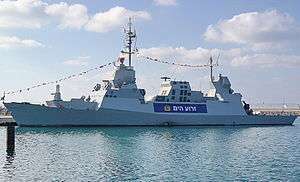 Three new Sa'ar 72-class corvettes are under construction at Israel Shipyards, the first of which should enter service in 2015. These are a stretched version of the Sa'ar 4.5 design that will incorporate stealth technology. Despite some misgivings from Germany, the contract for the sixth and final Dolphin-class submarine is still intact and it should be operational by 2017. ThyssenKrupp will also build four "Sa'ar" patrol vessels for EEZ duties such as protecting offshore gas fields. The ships will be based on the MEKO A-100 design like Germany's Braunschweig-class corvettes, suggesting they will be 90m long and displace around 1,800 tonnes, named Sa'ar 6-class corvette. This deal was signed in December 2014 and Germany is believed to be contributing up to €115m of the €1 billion cost. Previously Israel had hoped to acquire an up-armed version of the Freedom class of littoral combat ships from Lockheed Martin, but spiralling costs had made this impossible, along with a fallback option from Northrop Grumman/Huntington Ingalls Industries who built the Sa'ar 5 class. ↑ Cirincione, Joseph; Wolfsthal, Jon B.; Rajkumar, Miriam (2005). Deadly arsenals: nuclear, biological, and chemical threats. Carnegie Endowment. pp. 263–4. 1 2 3 4 "Anat Kidron MA Thesis, Israeli Navy Year of Foundation". Haifa University Israel. October 2000. Retrieved 2 December 2009. 1 2 "The last Battle of the Destroyer INS Eilat by Commander Yitzhak Shushan". Ma’ariv Publishing House. 1993. Retrieved 2 December 2009. ↑ "MACHAL Overseas Volunteers In Israel's War of Independence Page 28" (PDF). MOD IDF. 2007. Retrieved 2 December 2009. ↑ "A Tiny, but Hard-Hitting Battle Force". By David Hanovice North American Volunteers In Israel's War of Independence. 2007. Retrieved 5 December 2009. ↑ "Paul Schulman". NY Times. 18 May 1994. Retrieved 2 December 2009. ↑ Nadav Reis. "Known Decorations for Bravery Awarded to Machalniks who served in World War II - מח"ל עולמי". Retrieved 29 June 2015. ↑ "The last Battle of the Destroyer INS Eilat by Commander Yitzhak Shushan". Ma'ariv Publishing House. 1993. Retrieved 2 December 2009. ↑ Commander Shlomo, Ya'akobson a Hagana Veteran of the Royal Navy (1997). "Betaltala". MOD House. Retrieved 5 December 2009. ↑ "BOATS OF CHERBOURG Abraham Rabinovich". Bluejacket Books ISBN 1-55750-714-7. 1973. Retrieved 3 December 2009. ↑ "The Missile Boat War The 1973 Arab-Israeli War at Sea" (PDF). By Dave Schueler. 2009. Archived from the original (PDF) on 27 October 2009. Retrieved 3 December 2009. ↑ "The Battle of Latakia". Jewish Virtual Library. ↑ "IDF Ranks". IDF Spoke Man. 2009. Retrieved 3 December 2009. ↑ "Israel seeks sixth Dolphin in light of Iranian 'threat'". Janes.com. 1 October 2009. Retrieved 1 June 2010. ↑ "IDF submarine fleet bans dual citizenship". ynet. Retrieved 29 June 2015. ↑ "Ship Naming in the United States Navy". About.com. Retrieved 21 August 2014. 1 2 3 4 5 6 John Pike. "Navy Equipment - Israel". Retrieved 29 June 2015. ↑ "חדשות - צבא וביטחון nrg - ...נושאת מזל"טים: חיל הים כובש". Retrieved 29 June 2015. ↑ "Unraveling the History of the Israeli Navy, Part II". Frontpage Mag. Retrieved 29 June 2015. 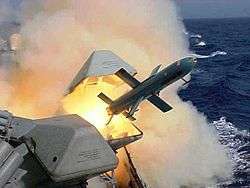 ↑ "IAI seeks foreign investors to develop new missile warship". Retrieved 29 June 2015. 1 2 Opall-Rome, Barbara (25 December 2014). 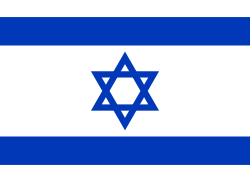 "Israel, Germany Seal Offshore Patrol Vessel Deal". Defense News. ↑ Hudson, Alexandra (15 December 2015). "Germany says will help finance four new Israeli warships". Reuters. ↑ "Israel Navy Commanders-in-Chief". Jewishvirtuallibrary.org. Retrieved July 30, 2016. Wikimedia Commons has media related to Israeli Navy.